Casa Lange is a 100 year old and completely refurnished back-to-back house, situated in the small and quiet village of Maro. 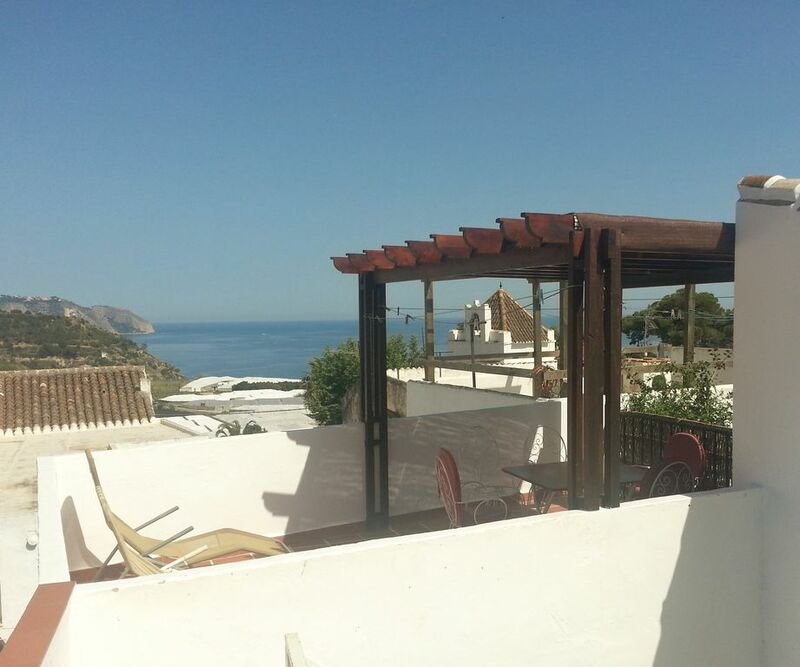 From the pergola-shaded rooftop terrace you have wonderful views over the mountains of Sierra Tejada and the coast from Nerja to Punta de la Mona. A 10 minutes walk takes you to the romantic creeks of Maro. The house offers a little living-room with fire-place and dining-area, a kitchen and a bathroom, upstairs you find two bedrooms (one of them with air-conditioning) with balconies and a TV room. Climate: The Costa del Sol has an average of 320 days of sun per year. The temperature in winter (November -February) hardly ever falls below 18° C, so the weather is spring like. It is warm enough to sunbathe all year long on the beach. In the summer months there is a light breeze that keeps the temperature pleasant. The region: The house is a very good starting point for trekking tours. The region eastern of Malaga is the quiet part of the Costa del Sol. It has not been spoilt by mass tourism. Discover the nature park Sierra Tejeda, the romantic Moorish villages like Competa and Frigiliana or the fabulous Alhambra in Granada (1 h by car). You will enjoy the friednly neighbourhood, the personal decoration, the original paintings and the simple but comfortable furniture. This is very comfortable and nice place. If you looking for traditional, andalusian house with roof terrace, you will be glad. In that place you can feel like Spanish, who life there. Maro is very fantastic and quite place, where you can spend lovely holidays. Location allow you to visit many popular places in Andalusia : Grenada, Nerja, Malaga, Caminito del Rey, Ronda... Only one minus: the smell, when we came to the house... naphthalene...? Thank you for your comentary. The smell is caused by the very old chimney. A glass door has been ordernd already. Séjour agréable, logement fonctionnel cependant manque quelques ustensiles de cuisine et un peu véstuste au niveau des meubles de la terrasse. Environnement très agréable et calme comme voulu. Das Haus liegt in einer sehr schönen Straße mit typischen andalusischen weißen Häusern. Der Ort Maro ist noch recht ursprünglich und nicht völlig von Touristen überlaufen. Es gibt einen schönen Strand mit Kieselsteinen, in der Nähe auch einige versteckte Buchten, wo es selbst im Juni noch recht leer war. Man muss allerdings einen kleineren Fußmarsch auf sich nehmen. Das Haus war sauber, hatte eine gut ausgestattete Küche, so dass man sich problemlos selbst versorgen konnte. Es waren ausreichend Handtücher, auch für den Strand und die Küche, verfügbar. Für die Kinder haben wir sogar Sandspielzeug ausleihen können. Die Dachterrasse ist sehr schön und bietet einen schönen Ausblick auf die Umgebung. Zu Beginn fiel uns der Asche-Geruch vom Kamin stark auf, ließ aber in den Folgetagen nach. Wir haben den Kamin allerdings nicht benutzt. Der Kühlschrank ist schon etwas in die Jahre gekommen, was uns aber nicht sonderlich gestört hat. Die Haushälterin, die in unmittelbarer Nähe wohnt, war sehr nett und hilfsbereit. Wer es gerne etwas ursprünglicher mag und den Touristenrummel nicht direkt vor der Haustüre haben muss, ist in Maro genau richtig. La casa corrisponde alla descrizione, è molto carina, è su tre livelli ed è in stile andaluso. Abbiamo trovato tutto il necessario per la nostra famiglia con due bambini di 10 e di 2 anni i quali, a loro volta, sono stati deliziati dalla presenza di tanti giochi. Il proprietario è disponibile ma non vive a Maro e, così, è necessario contattarlo telefonicamente in caso di bisogno. Sarebbe necessario, magari, scrivere in casa delle informazioni per gli ospiti anche in lingua inglese e non solo in tedesco. La casa è ubicata in una stradina molto bella e caratteristica ma dove non c'è il parcheggio che, invece, si può trovare lungo la strada principale o vicino alla piazza del paese e non è a pagamento. Le persone che vivono nella via sono davvero simpatiche e cordiali e molto simili agli italiani del Sud come noi. Ci sono due spiagge a circa un Km raggiungibili meglio in auto perché noi con i bambini abbiamo fatto un po' di fatica a piedi. A circa 10 minuti di auto si può facilmente raggiungere Nerja che è un pueblo fantastico. Noi ci siamo spostati tutti i giorni senza problemi in lungo e in largo per l'Andalusia raggiungendo anche Siviglia, Cordoba, Ronda ed i posti più belli da visitare. Il ricordo di una vacanza così bella associata alla "nostra casa andalusa" ci accompagna con nostalgia oggi e lo farà per molto tempo a venire. Grazie mr. Lange. tranquilidad y silencio en la playa en pleno agosto de la costa tropical. Increible pero cierto. Pueblecito que guarda su esencia y casa fresquita con todo lo necesario. Playa a 15 minutos andando, recomendamos la Caleta pues no tiene acceso en coche y está más tranquila. Azotea para cenar con la fresca y tumbarse a ver las estrellas. Das Ferienhaus Lange hat uns gut gefallen. Trotz Aufenthalt mit 5 Personen hatte jeder die Möglichkeit sich irgendwo zurück zuziehen. Sehr geschmackvoll eingerichtet. Zum Stand ist es zwar ein Stück zu Fuß, allerdings lohnt es sich auch die anderen Strandbuchen in der Nähe anzufahren. Man kann dort super Schnorcheln! Wir haben den Aufenthalt sehr genossen. From Malaga Airport you reach Maro by the highway in 55 min. The village is settled on a magnificent spot in the spurs of the Almijara mountain range, its tropical landscape, marked out by plantations of sugar cane and tropical fruits like 'Aguacate' and 'Chirrimoya', offers small beaches between the coastal cliffs and wonderful trekking tours in the bordering nature park of Sierra Teajda, where the mountains (2000 m) tumble to the sea. In the village there are small supermarkets and restaurants. Golf: You reach the nearest golf-links by car in 20 minutes. Ski: During the winter months you reach the ski-area of Sierra Nevada (3200 m)near Granada in less then 1,5 h.
Bettwäsche, Handtücher, Wasser und Strom und Endreinigung für 2 Personen sind inklusive. Die Endreinigung beträgt für jede weitere Person zusätzlich 20€.